The main changes to the MAX flight instruments are the new four 15.1 inch LCD cockpit display screens in landscape orientation. MAX Display System, showing the F/O inboard and outboard displays. 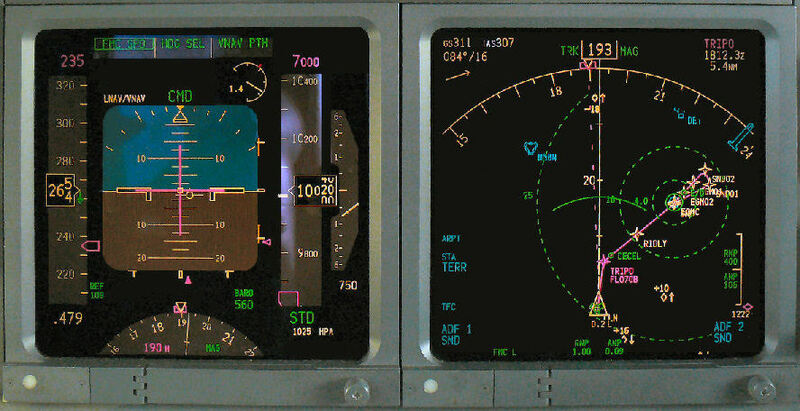 From left to right: Engine displays, Nav display (in map mode), PFD and clock. The NG's have 6 Display Units (DU's), these display the flight instruments; navigation, engine and some system displays. They are controlled by 2 computers - Display Electronics Units (DEU's). 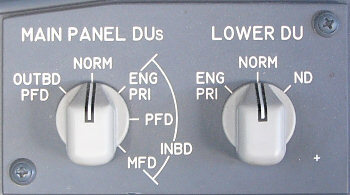 Normally DEU 1 controls the Captains and the Upper DU's whilst DEU 2 controls the F/O's and the lower DU's. The whole system together is known as the Common Display System (CDS). The DU's normally display the PFD's outboard, ND's inboard, engine primary display centre (upper) and engine secondary display lower. 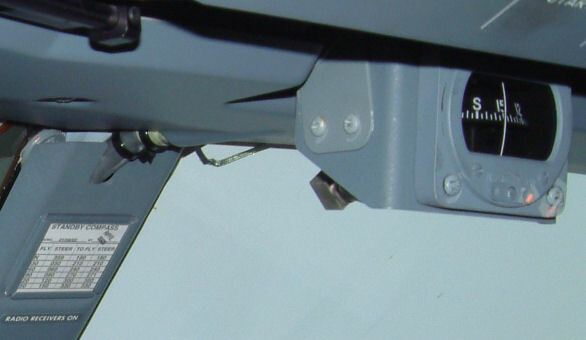 Although they can be switched around into almost any other configuration with the DU selector (shown left). · The CDS FAULT message is intended to be activated on ground to tell the maintenance crew or air crew that the airplane is in a non-dispatchable condition. 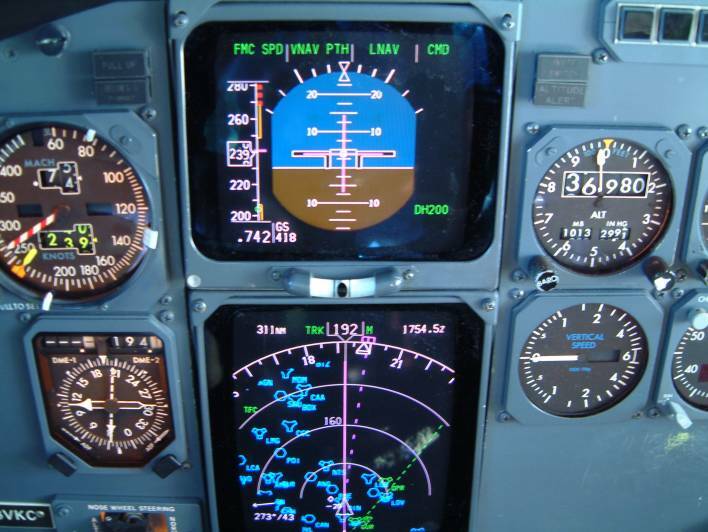 · The DISPLAY SOURCE message is annunciated in air to tell the crew that all the primary display information is from one source and should be compared with all other data sources (standby instruments, raw data, etc.) to validate its accuracy. Since the DISPLAY SOURCE message is intended to be activated in air and CDS FAULT is intended to be activated on ground, air/ground logic is used by CDS to determine which message is appropriate. The air/ground logic system uses a number of inputs to determine airplane state. One of the inputs used is “engines running”. CDS uses the “engines running” logic as the primary trigger for changing the CDS FAULT message to its in-air counterpart. The “engines running” logic is used in case the air/ground data isn't correct as a result of other air/ground sensing faults. The DISPLAYS - SOURCE selector is only used on the ground for maintenance purposes (to make all 6 DU's be powered by either DEU 1 or 2). This may be why the switch is a different shape to the other three; if not, it is still a good way to remember that this is a switch that pilots should not touch! The DISPLAYS CONTROL PANEL annunciation merely indicates that an EFIS control panel has failed. There is an additional, rather bizarre, attention getter because the altimeter will blank on the failed side, with an ALT flag, until the DISPLAYS - CONTROL PANEL switch is positioned to the good side. Note that this is not the same as the EFI switch on the -3/4/500's which was used to switch symbol generators. The speed tape shows minimum and maximum operating speeds. The maximum operating speed provides a 0.3g manouvre margin to high speed buffet. The minimum operating speed is computed from the SMYD as follows: The SMYD has two flavours of Min manouvre speed. The first is identified as Vmnvr, the second as Vbl (low speed buffet). The transition from Vmnvr to Vbl is dependent on gross weight, but in general Vmnver is output below 22,000 feet and Vbl above that altitude. Although not used directly in the calculation of Vmnvr, once the airplane starts flying,	gross weight becomes a factor indirectly (in the calculation of Vmnvr) via the load factor calculation. FMC Gross Weight is used by the SMYD in the switching logic from Vmnvr (min man speed) to Vbl. 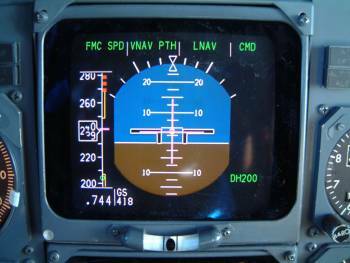 One of the many customer PFD options is an analogue/digital angle of attack display. The red line is the angle for stick shaker activation, the green band is the range of approach AoA. 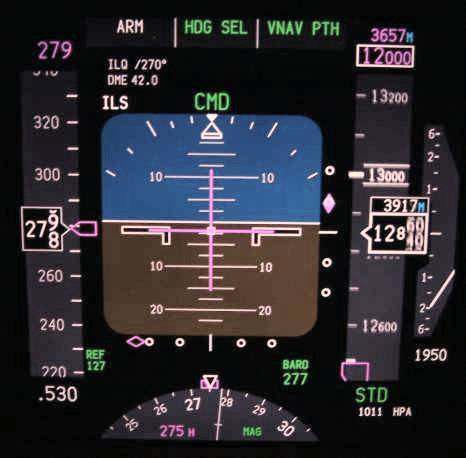 The 737NG Common Display System has had several software updates to incorporate additional features, improvements to existing features and bug fixes. Each new update is known as a Block Point. There have been six updates from BP98 to BP15. The latest software is BP 15, introduced in Oct 2016, fitted as standard from L/N 6119 onwards and to earlier aircraft by retrofit. A list of each of their features is given in the book. 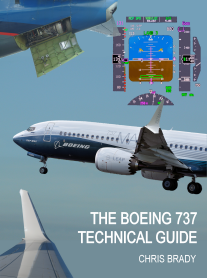 With increased navigational accuracy available and hardware/software improvements on the 737, many new types of approaches have been developed. Cat IIIb, LNAV/VNAV, RNAV(GPS), RNAV(RNP), IAN, GLS. Cat IIIB ILS documented as "Fail-Operational", is very similar to the current ILS display except that rollout guidance will display as "ROLLOUT" (armed) underneath the VOR/LOC annunciation. Fail-Operational aircraft have an extra MFD button “C/R” (Clear/Recall) to display system messages on the upper display unit. These messages can be either "NO LAND 3" or "NO AUTOLAND". Note Cat IIIa is still possible with a NO LAND 3 advisory. In this case green "LAND 2" annunciations will appear on both outboard display units. LNAV/VNAV most non-precision approaches which are in the FMC database may be flown to MDA in LNAV/VNAV. Look for the coded GP angle in the LEGS pages. NPS (Navigation Performance scales) combine the display of ANP/RNP with LNAV/VNAV deviation to give either a Cat I approach of its own or a transition to an approach. Note: NPS provides crew awareness of airplane position with respect to the intended path and RNP. They are not required for VNAV approaches, which may be flown with standard displays. Where FAC = Final Approach Course and G/P = Glidepath. GNSS Landing System (GLS) Approaches use GPS and a ground based augmentation system (GBAS) to give signals similar to ILS signals and will probably replace ILS in the future. Certified May 2005, it is initially Cat I but will become Cat IIIB and should have the capability for curved approaches. Most of the above approaches require FMC U10.5+, CDS BP02+, FCC -709+ and DFDAU & EGPWS. 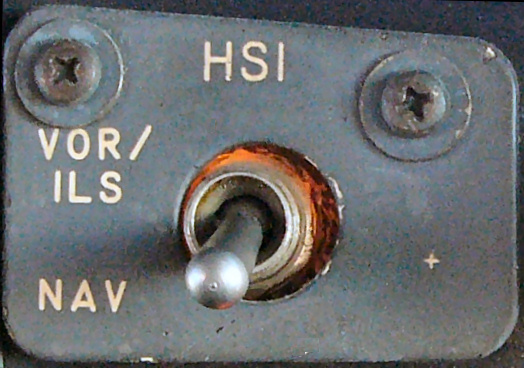 The big Gotcha with SP-177 equipped 737-200Advs and non-EFIS Classics were the HSI source selectors, sometimes referred to as “Killer Switches”. 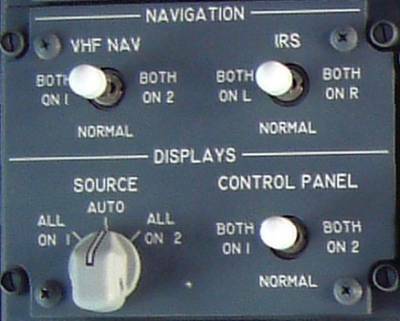 These were located either side of the MCP and changed the HSI to show deviation either from the LNAV or ILS/VOR track. 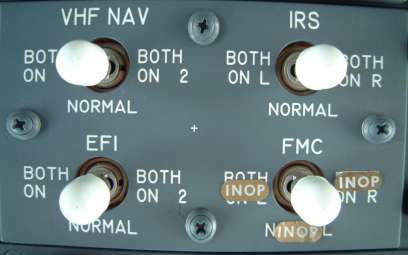 It is vitally important that these switches are set to VOR/ILS before commencing an approach otherwise you will still be indicating LNAV deviation rather than LLZ deviation. The standard Classics had no way to display metric altitude, which is used in some countries such as Russia and China. 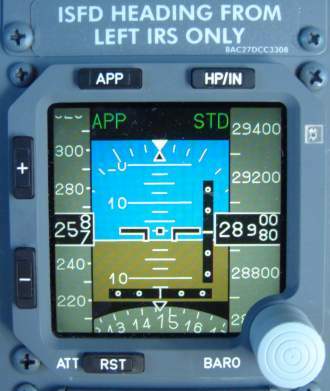 An optional digital metric altimeter could be fitted which was usually located below the VSI. 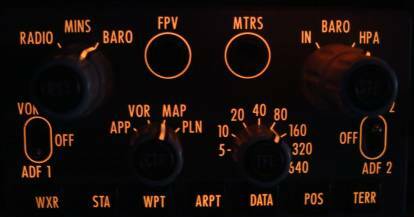 The NG and MAX can display metric altitude by selecting MTRS on the EFIS control panel. 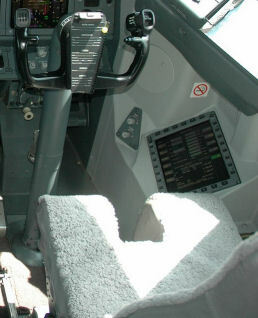 The 737-300's were soon available with EFIS, an option which most operators took. 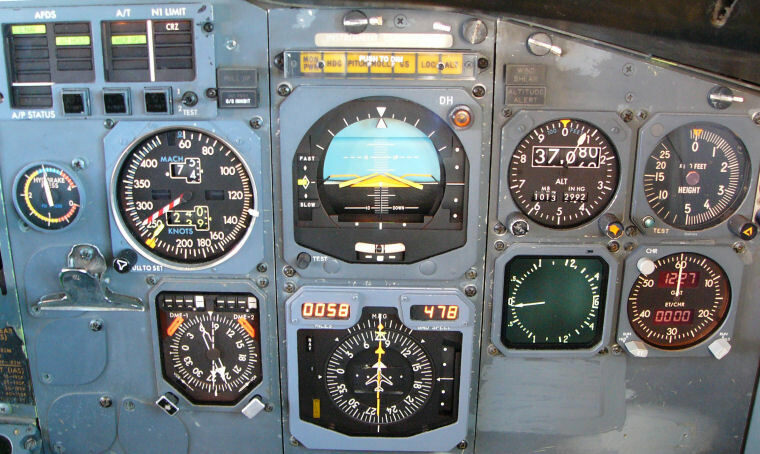 The EADI included a speed tape, radio altimeter, groundspeed indicator, and FMA annunciations. The EHSI has a selectable display either to represent the old HSI or a moving map display. See navigation section for details. 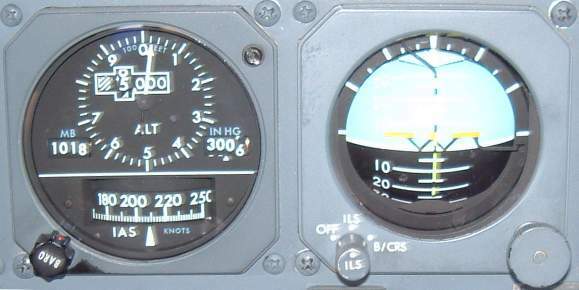 The flight instruments use information from 2 Air Data Computers -Classics / Inertial Reference Units -NG's, which have separate pitot-static sources. The ADC/ADIRU’s are powered whenever the AC busses are powered. Aspirated TAT probes can either be identified visually (see below) or by the presence of a TAT test button on the pitot-static panel. 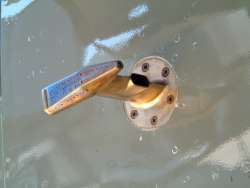 To get an approximate OAT indication on the ground an air-conditioning pack must be on, whereas unaspirated probes require the pitot heat to be off. The flight recorder starts when the first engine oil pressure rises. It will continue to record for as long as electrical power is available. If display unit cooling is lost, then after a short time the Electronic Attitude Display Indicator (EADI) colours will appear magenta and the WXR DSPY caption will be shown on the EHSI. This can be rectified by selecting ALTERNATE equip cooling supply and/or exhaust fans. The NG's use Honeywell flat panel displays rather than the CRT's of the classics and have the advantages of being lighter, more reliable and consume less power, although they are more expensive to produce. 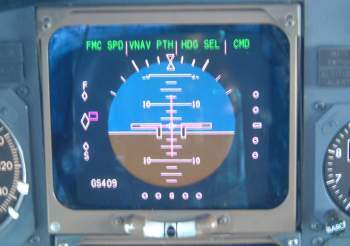 The 737-3/4/500 EADI display, with fast/slow indicator. 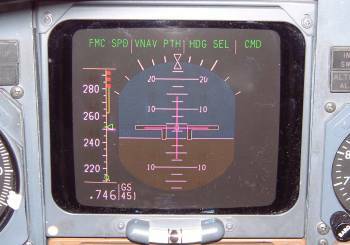 The 737-3/4/500 EADI display, with speed tape. 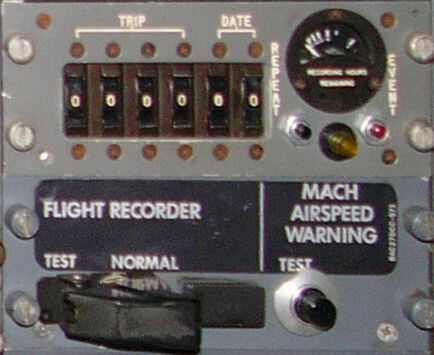 The 737-3/4/500 EADI display, with speed tape but no rolling digit curser. Overheating of an individual display unit will cause that unit to blank until it cools down when it will return. If 2 display units on one side blank then the problem is with that symbol generator, SG FAIL will annunciate in the centre of both displays. The display can be restored by using the EFIS transfer switch. This will enable the remaining symbol generator to display onto both sides, the output is controlled through the EFIS control panel of the good side. Caution: the autopilot will disengage when the EFI switch is repositioned. The standby airspeed indicator & altimeter uses aux pitot & alternate static sources and no ADC/ADIRU’s. The Integrated Standby Flight Display started to appear in 2003 to replace the mechanical standby artificial horizon and ASI/Altimeter. Personally I find the new ASI & Altimeter much easier to read but the ILS more difficult. The + - buttons are just brightness controls. The ISFD also sends inertial data to the FCCs which use the data during CAT IIIB approaches, landings and go-around. Interestingly the ISFD cannot be switched off from the flightdeck - even by pulling the ISFD c/b on the p18 panel. It has its own dedicated battery and the ISFD c/b only removes power from the battery charger, so let us hope that one does not start to smoke in-flight! The battery will give 150 mins of power. Finally, if all else fails there is a standby magnetic compass! The FDR is located above the ceiling above the rear galley. There have been several different models of FDR in the life of the 737 which can collect anything from 30 minutes to hundreds of hours of data of 8 to hundreds of parameters. Early FDR's, as fitted to 737-200's, comprised metal scribes which etched their data into a 150ft long roll of metal foil. These would last about 300hrs but only recorded vertical acceleration, heading, IAS and altitude, plus binary traces such as date, flight number and time of R/T transmissions. A gauge on the panel (see below) shows the recording hours remaining before the foil spool needs replacing. Later Digital FDR's (late 200's & classics) record onto a 1/4-inch wide, 450 feet long magnetic tape and the newest Solid State FDR's (later classics & NG's) record data onto memory chips. Late model 737-3/4/500 FDR's record 25 hours of data. The protective casing includes an inner aluminium cover, isothermal protection shield, an outer stainless steel casing and an exterior stainless steel dust cover. This enables it to withstand a crush force of 20,000 pounds per axis, and provides impact protection of 1000 g's for 5 msec. It is protected from heat by an isothermal insulation which maintains the inner chamber at a safe temperature. It also has an underwater location device that transmits under water for a minimum of 30 days. 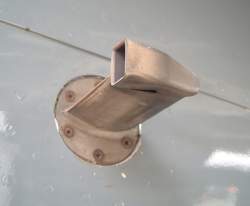 The FDR of the 737-NG is similar to that described above but can withstand 3400 g's of impact, 20,000ft depth of water and temperatures of 1,100C for 30mins. The FDR starts recording as soon as the first engine oil pressure rises. Calculate take-off or landing performance. Contain the aircraft technical log. Store navigation charts & plates. Store company manuals, FCOMs, crew notices, etc. Display on-board video surveillance cameras. The advantages to crew are the accuracy of the data and ease of use. The advantages to the airlines are the cost benefits of a less paper cockpit and real time data transfer. Class 1: Fully portable. Eg a laptop. Class 2: Portable but connected to the aircraft during normal operations. Eg tablet & docking station. Class 3: Installed (non-removable) equipment. The Boeing Business Jet stands at a crossroads in avionics technology—exploiting all the flight deck systems available to airlines operating the 737, while serving as a showcase for advanced bizjet avionics that air carriers may one day want. The BBJ often serves as a pathfinder for the latest systems that eventually could find their way onto commercial 737 flight decks. Improved situational awareness is a case in point. Gulfstream, for example, pioneered the use of enhanced vision systems (EVS) with a forward-looking infrared (Flir) camera on large-cabin bizjets. This allows pilots to look through a head-up display (HUD) to see Flir imagery of a runway at night and in smoke, haze, rain and snow (but not in large-droplet fog). The enhanced vision capability is more than just a safety feature. The FAA allows business jet pilots to use EVS images to fly as low as 100 ft. AGL (instead of 200 ft. during a Category-1 approach) before having to see the runway visually. Currently, airline pilots can’t do this. However, the FAA and the European Aviation Safety Agency are considering changing this rule to allow airlines to descend to 100 ft. with EVS, according to several avionics company officials. This could happen as early as next year. There’s already substantial airline interest in enhanced vision, says Steve Taylor, the BBJ chief pilot. “I’ll wager if the FAA grants that OK to the airlines [for 100 ft. ], they will be beating on our door,” he adds. Rockwell Collins is working with Boeing on the EVS program. And Max-Viz Inc., of Portland, Ore., is developing a multisensor, uncooled camera to meet a Rockwell Collins specification. It has both a short-wave and a long-wave infrared sensor and a visible-light camera in one unit. The BBJ also will have a new version of the Rockwell Collins HGS-4000, called the -4000E. This modification of the head-up guidance system includes new hardware and software to allow the display of video imagery from the Flir camera. The BBJ has head-up guidance for the pilot as a standard feature, while the system is optional on the 737NG. Taylor says every avionics system that’s optional on the airline version of the 737 is standard on the BBJ. Meanwhile, Rockwell Collins just began flight testing the BBJ enhanced vision system on its Sabreliner test­bed, and the EVS will be flown on a customer’s BBJ during the winter. Certification should occur in mid-2008. Should airlines become more interested in having it on a 737NG, it wouldn’t take much additional work to commercialize the system, says Taylor. “The aircraft certification rules are the same—Part 25,” he notes, so the certification effort on the BBJ should transfer easily to the 737NG. The plan is to display the EVS imagery not only on the HGS for the pilot but also on one of the six Honeywell cockpit displays (the one on the pedestal so the copilot also can see the Flir imagery). Taylor notes that head-up guidance systems made their first entry at Boeing on the BBJ and then moved to the commercial aircraft production line. But earlier, HUDs were already flying on existing airline aircraft because carriers such as Southwest and Alaska Airlines had installed them as retrofit items. However, avionics is not the only area where technical innovation started in the BBJ program and was then incorporated on commercial transports. Winglets, a key fuel-saving device, is an example. “In a sense, we are a Skunk Works for commercial airplanes,” says Taylor. As for the next big thing in business aviation, it will likely be another situational-awareness advance called synthetic vision. A 3D digital map of the terrain and obstacles ahead of the aircraft will be shown to the pilots of Gulfstream business jets soon, thanks to Honeywell. Rockwell Collins is developing a similar system for Bombardier. This Aviation Week & Space Technology pilot saw a Honeywell prototype last year on a Cessna Citation V (AW&ST Oct. 16, 2006, p. 66). Our night flight passed over the Phoenix area where I attended U.S. Air Force pilot training in the early 1970s. The view out the windscreen was often pitch-black, with mountains below shrouded in darkness. But I could see the “synthetic” terrain on the primary flight display created from a database that portrayed the scene ahead as if it were broad daylight. In 1971, a T-38 crashed into a nearby mountain in the era before synthetic vision. A key question is, How long will it take for the huge safety advance of synthetic vision to show up on commercial flight decks? Since I no longer fly T-38s, I have to travel economy class on narrow- or wide-body jets. If airline pilots had EVS and SVS, I would feel safer as a passenger flying into airports surrounded by high terrain. But as with EVS and the possible FAA rule change on 100 ft., SVS will need a business case to earn its way onto an airline flight deck. At the moment, it’s not clear what that rationale will be. Taylor says technology specialists at Boeing are looking at synthetic vision, and he believes its adaptation will follow a path similar to the one for enhanced vision. In the business jet market, “the customer base is much more interested in technology and willing to pay for it,” he notes. Another way the BBJ benefits from 737 avionics is that the standard-fit radar is an airline-class system—Rockwell Collins’ multiscan WXR2100, which is flying with 100 airlines. It’s a more capable system than many of the radars currently installed in business jets. Keith Stover, Rockwell Collins’ radar marketing manager, says the main benefit for BBJ pilots is automatic adjustment of the radar as well as ground-clutter suppression. In September, Rockwell Collins said it will provide a multiscan radar for bizjets to accommodate the smaller antenna sizes they need of 12 and 18 in. So this is an example of airline-class avionics technology flowing to business aviation by way of the BBJ flight deck. The airline version, which is already standard on the BBJ, has a 28-in. antenna and includes wind shear protection. Last summer, I flew on a BBJ over the North Atlantic. During the flight, Rockwell Collins radar engineers were perfecting new software to allow the multiscan radar to improve its automatic detection of storms in a particular region (AW&ST July 9, p. 44). This new geographic-discrimination software will be available soon on the BBJ. Additional fuel tanks are added after the aircraft leaves the factory and goes to DeCrane Aerospace at Sussex County Airport in Georgetown, Del. This is also where the new enhanced vision system will be fitted.